Space Ghost #1 (1987) Steve Rude Cover Signed by Steve Rude W/COA & Pencils, Mark Evanier & Steve Rude Story, 1st apps of Moltar and Brak "The Sinister Spectre" Inks by Willie Blyberg. Painted color by Ken Steacy. A mysterious figure breaks Space Ghosts most dangerous foes out of Gaolworld. It will take the combined power and ingenuity of Space Ghost, Jan and Jace, and Blip the monkey to recapture them. However, even if they do, they still have to face the hooded figure who freed them. While the face behind that hood is the last one anyone would expect. 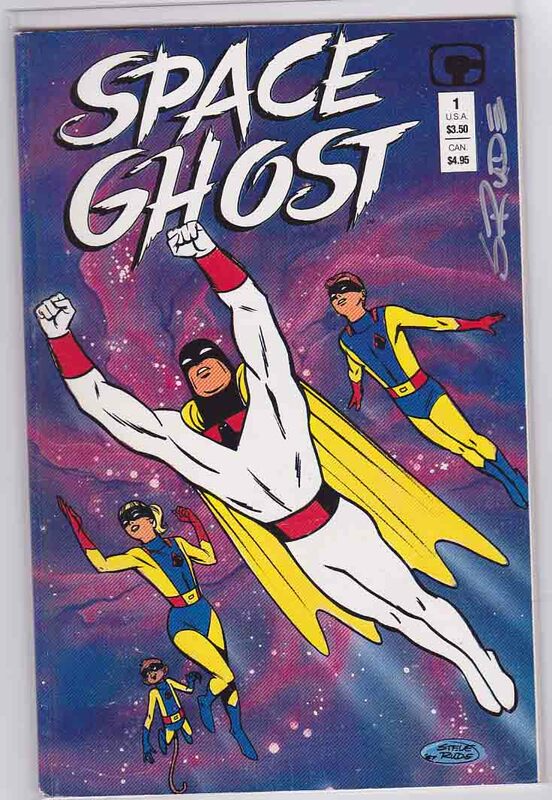 Contains a 5-page article on the development of the original Space Ghost cartoons. Won the 1987 Eisner award for Best Art Team (Steve Rude, Willie Blyberg, and Ken Steacy).